Activities for All at Dreams Las Mareas! Beach and pool days are relaxing and fabulous while on a Dreams® Las Mareas getaway, but sometimes everyone needs a little activity and excitement when exploring somewhere new! Luckily at Dreams Las Mareas in Costa Rica, you and your family can choose from a number of activities for the young and young at heart. Slide into fun at Dreams Las Mareas! Free to Explore is Back at Dreams Las Mareas! Looking for the adventure of a lifetime? Make Costa Rica your next vacation spot! Dreams® Las Mareas Costa Rica is the perfect base to discover the natural wonders of this amazing tropical oasis, and here’s the best part—it’s Free to Explore. Read on to find out how you can make your next Dreams Resorts getaway your best yet with a complimentary excursion from Dreams Las Mareas. You’ll be Free to Explore with a complimentary excursion when you stay seven nights or more at Dreams Las Mareas Costa Rica! Get Up and Get Active at Dreams Riviera Cancun! 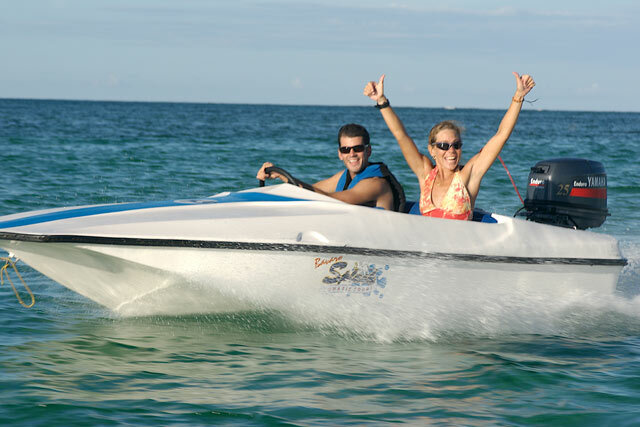 At Dreams Riviera Cancun Resort & Spa you can do as much or as little as you like. After all, it’s your vacation! If you like to get up and get active while on vacation, take a moment to browse through some of the exciting activities you can participate in during your stay at Dreams Riviera Cancun! 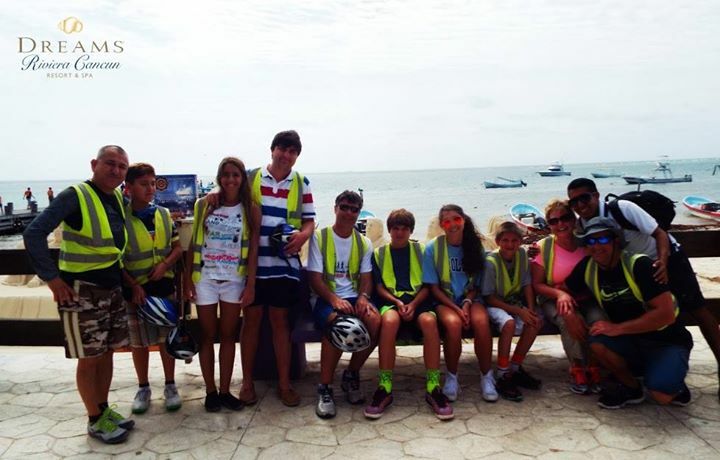 This group had an amazing time on their bike tour at Dreams Riviera Cancun Resort & Spa! Unlimited-Luxury®, gourmet dining, full-service spa, endless activities and award winning beaches are just a few reasons to book your next vacation at Dreams Tulum Resort & Spa. We welcome couples, families and singles to experience our resort which is set in a unique location in the Mexican Caribbean. Dreams Tulum is less than five minutes from the ancient city of Tulum, which is home to the only beachfront ancient Mayan ruins. The archeological site is a must-see for our guests. Learn about Mayan history while admiring the pyramids, ceremonial structures and old temples with the Caribbean Sea as the backdrop. The word “tulum” means wall in Mayan. It is believed that the city was named Tulum because it was known as the “walled city” dating back as far as approximately 564 A.D. This magical, mystical place is a fascinating experience that you’ll want to include during your stay at Dreams Tulum. Tulum is still making history today as it was recently recognized by TripAdvisor’s 2011 Traveler’s Choice Awards as the #5 “Best Beach in the World” and #4 “Best Beach in the Caribbean & Mexico”. The sugar-white sand beaches and crystal-clear blue waters really stand out from the rest because of its rare mix of beach, archeology and village. Below is a list of some other nearby points of interest to include in your itinerary. Book now and start planning today! 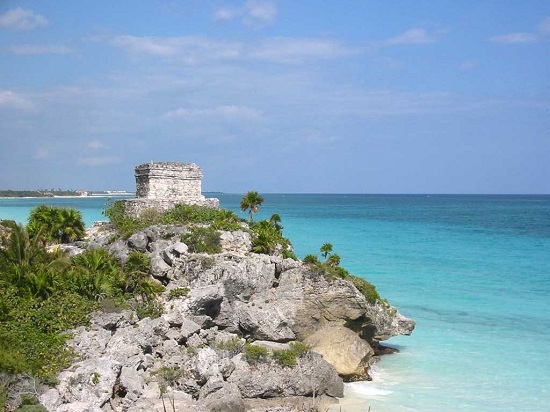 The Caribbean Sea is backdrop for Tulum’s beachfront Mayan ruins. 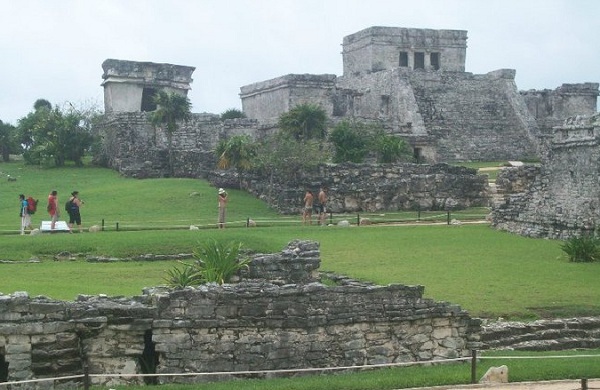 Tourist explore the sites of Tulum’s Mayan ruins. When visiting Dreams Huatulco Resort & Spa, there are many activities offered at our resort, but if you are looking to explore some local attractions, Huatulco has many options to choose from. Here are a few nearby attractions to consider when staying in Huatulco. The Botazoo Ecological Park. This park is an ecological area located 10 miles from Huatulco. It is a bird lover’s paradise with over 120 different species that can be spotted along the river and in the lagoon. It is also home to the archeological site Punta Celeste. This area also offers excellent rappelling adventures with a rock wall that measures 50 meters. The Copalita Waterfalls. The Copalita Waterfalls are located an hour and half from Huatulco along the Copalita River, just above the village of Santa Maria Xadani. The majestic waterfalls vary in size and offer swimming, hiking and relaxation in an all natural setting. The larger waterfalls have a swing that you can swing and rapel from. La Crucecita. La Crucecita is located 10 minutes from the hotel area of Tangolunda. The town comes complete with a park, zocalo and a church that is said to have the largest painting of the Virgin de Guadalupe on the ceiling. La Crucecita is where most of the restaurants, cafes, boutiques, craft stores and markets are located. The Zapotecas Mud Bath. Mud baths were used by the Zapotecas, Mayans and Aztecs for its medicinal healing powers. Today, mud baths are offered by the “The Women of La Bocana Cooperative” on the beach at La Bocana. The treatment is exclusively the work of the women of the village, who are direct descendants of the Zapotec people. Stop by our tour desk if you’d like more information or if you’re interested in booking an excursion to any of these local attractions!